BOSTON (TheStreet) -- Alcoa (AA, the largest U.S. producer of aluminum, kicks off the quarterly earnings-reporting season after the closing bell today. That's the signal for investors to prepare for a flurry of financial reports this week. 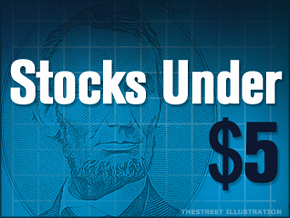 Those with holdings of stocks under $5 need to be especially well-prepared. Trading in stocks under $5 can already be volatile due to a myriad of reasons, from a small number of shares outstanding to scant analyst coverage to speculation on rapid growth. Earnings results can also lead to big swings in share price. For example, Oilsands Quest ( BQI shares have fallen more than 21% since the company reported operating results July 6. TheStreet narrowed the list of companies investors should be watching to 10, ranked by market value, based on Bloomberg's earnings-release schedule. The list includes stocks currently trading on the New York Stock Exchange, Nasdaq and the NYSE Amex. Company Profile: Simulations Plus is a developer of drug discovery and development simulation and modeling software. Analyst Ratings: Taglich Brothers is the only research firm with coverage of Simulations Plus, rating the stock a "speculative buy" with a $4.05 price target. What To Watch For: Simulations Plus already reported preliminary results for its fiscal third quarter, although the company did not release net income figures due to uncertainty of income taxes. Simulations Plus did say that the company was profitable for a 15th straight quarter, and that revenue rose 10% from a year ago to $3.4 million. Company Profile: Emerson Radio is one of the largest volume consumer electronics distributors in the U.S., designing DVD players, audio accessories, microwave ovens, home theater, high end audio products, office products, mobile stereo and wireless products. Analyst Ratings: No Wall Street research shop follows Emerson Radio. What To Watch For: In the company's fiscal third quarter, Emerson Radio's bottom line benefitted from a realized gain on the sale of an auction rate security. Without that gain, net income would have fallen from a year ago. Revenue also dropped from a year ago, although Emerson has been effective in cutting SG&A and operating costs. Investors should keep an eye on Emerson's cost-cutting abilities and whether it can grow revenue after a challenging fiscal third quarter. Company Profile: Joe's Jeans designs, sources and distributes its Joe's and Joe's Jeans branded apparel products, including denim-wear and denim-related products, to over 1,200 retail locations. Analyst Ratings: Three research shops, including Roth Capital Partners, have a "neutral" or "hold" rating on Joe's Jeans. The only other firm with coverage, EVA Dimensions, has a "sell" rating on the stock. What To Watch For: Joe's Jeans saw its operating profit plummet from nearly $2 million in the fourth quarter of 2010 to only $523,000 in the first quarter. That came as revenue fell to $21.2 million while total operating expenses increased due to a jump in SG&A expenses. One transition investors should pay close attention to has been the contribution of the company's retail segment compared to wholesale. Company Profile: Oxygen Biotherapeutics develops intravenous and topical medical products that deliver oxygen to tissues in the body. The company is currently focused on traumatic brain injury, wound healing, dermatologic indications and decompression sickness. Analyst Ratings: There are currently no analysts following Oxygen Biotherapeutics. What To Watch For: Oxygen Biotherapeutics hasn't reported positive net income since the quarter ended April 30, 2010, although that can be typical for a development stage biomedical company. Shares of Oxygen have managed to stay positive even after a sharp drop last month following the company's announcement of a $4.6 million private placement. For more upside, investors should be on watch for management comments on the company's Dermacyte skin care products and additional distribution agreements. Company Profile: Ossen Innovation is a China-based manufacturer of an array of plain surface, rare earth and zinc coated pre-stressed steel materials. Analyst Ratings: Ossen Innovation is followed only by Global Hunter Securities, which rates the stock as a "buy." What To Watch For: Ossen Chairman Liang Tang said he expects the company to grow revenue in 2011 to $138.5 million to $144.6 million, compared with $117.5 million in 2010. Investors should keep an eye on the company's margins as Tang has said he expects gross margins for coated products to increase to 25% to 30% from 23% due to a shortage of coated pre-stressed steel materials. Company Profile: Riverview Bancorp is the holding company of Riverview Community Bank, which provides financial solutions through its network of 17 branches in the Southwest Washington and the Portland metropolitan area. Analyst Ratings: Riverview Bancorp garners a "buy" from Wunderlich Securities and an "outperform" from Raymond James analysts. What To Watch For: Investors should watch for Riverview to continue its streak of improving credit quality. The bank holding company saw non-performing loans fall by 27% during the fourth quarter to $12.3 million. To put that in perspective, the balance of non-performing loans stood at $36 million on March 31, 2010. Company Profile: Intervest Bancshares is the parent company of New York-based Intervest National Bank, a nationally chartered commercial bank that has six full-service banking offices in Clearwater and Gulfport, Fla.
Analyst Ratings: Sandler O'Neill is the lone research shop following Intervest, rating the company a "buy" with a $4 price target. What To Watch For: During the first quarter, Intervest saw the total provision for loan and real estate losses drop to only $2 million from $11.6 million a year ago and $4.7 million in the fourth quarter of 2010. The company said that reflected fewer problem assets and credit rating downgrades. As there isn't a lot more room to reverse those provisions for loan losses, investors will be looking for continued improvements in nonaccrual loans and real estate owned, which fell to $72 million in the first quarter from $154 million a year ago. Company Profile: Premier Exhibitions is a provider of museum quality touring exhibitions. Currently, the company is touring three exhibitions on the Titanic, which sank a century ago. Analyst Ratings: No research analyst has coverage on Premier Exhibitions. What To Watch For: In June, Premier Exhibitions announced preliminary results for its fiscal first quarter. Revenue fell to $9.7 million from $11.1 million in the year-ago period on the company's decision to scale back its BODIES exhibitions. However, lower operating costs and higher merchandise profits pushed gross margin to $5.5 million from $4.7 million in the same quarter a year earlier. When the full numbers are released, investors will want to see how the company's efforts to improve operations and reduce costs are truly working. Company Profile: Silver Bull Resources is an exploration stage mineral mining company focused on the Sierra Mojado project in Mexico. The company was previously known as Metalline Mining until a name change on May 2. Analyst Ratings: Global Hunter Securities is the only research shop following Silver Bull. The firm suggests investors accumulate shares. What To Watch For: Silver Bull has not realized any revenues from its planned operations as it is considered an exploration state company. One area investors will be watching is general and administrative costs, which jumped 73% in the previous quarter to $1.2 million. Because of the increase, the company reported a consolidated net loss of nearly $1.6 million, compared with only $31,000 in the same quarter a year prior. Company Profile: Peregrine Pharmaceuticals is a clinical-stage biopharmaceutical company developing monoclonal antibodies for the treatment of cancer and viral infections. Analyst Ratings: Peregrine nets a "buy" rating from Roth Capital Partners and McNicoll Lewis. Both research shops have a $10 price target on the stock. What To Watch For: In Peregrine's fiscal third quarter, revenue plunged to $2.9 million from $9.9 million in the same quarter a year prior. Peregrine blamed the decrease on both a reduction in government contract revenue as well as lower contract manufacturing revenue due to the level and timing of services provided to third-party clients of its Avid Bioservices subsidiary. In addition to watching revenue, investors should be on the lookout for any update to Phase II survival data for its treatment of non-small cell lung cancer.